"The 2 cars that were painted red and owned by Colorado Railcar were Slumbercoaches NYC #10380/#10817 Tonawanda Harbor and NYC #10800/NP #333 Loch Tay." These 2 cars are privately owned and are stored on blocks in the weeds in Strasburg, CO. The 2 cars that were painted red and owned by Colorado Railcar were Slumbercoaches NYC #10380/#10817 Tonawanda Harbor and NYC #10800/NP #333 Loch Tay. In the above photo from Jody Moore's website and in the main photo on the Ozark Mountain page for the Loch Tay, I noticed a third car, also painted deep red, and in the above Jody Moore photo, a fourth car in Amtrak Phase I. Does anybody know the identities of either of these cars? Thanks in advance! 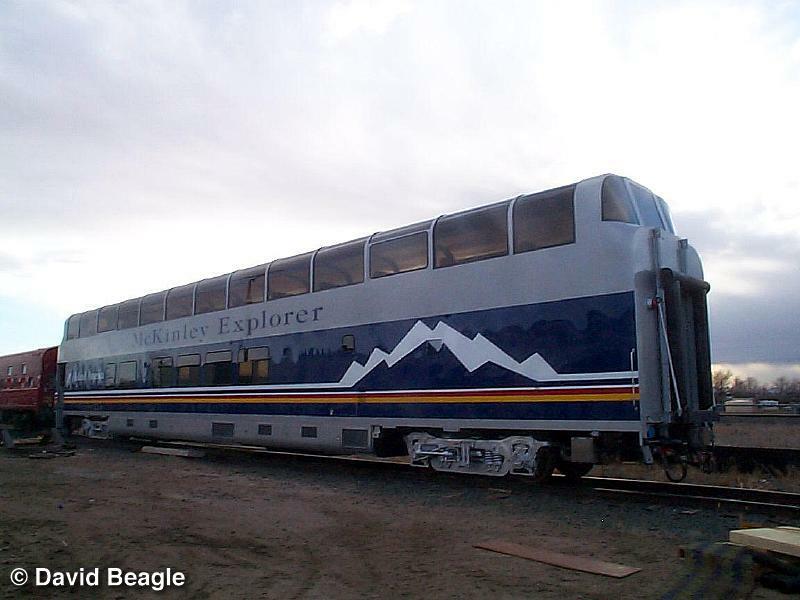 "In the above photo from Jody Moore's website and in the main photo on the Ozark Mountain page for the Loch Tay, I noticed a third car, also painted deep red, and in the above Jody Moore photo, a fourth car in Amtrak Phase I. Does anybody know the identities of either of these cars? Thanks in advance!" The 3rd red car is a former Amtrak, former Army SLC 1952 baggage dorm. The car in Amtrak paint is what may be the only surviving baggage dorm from the Mid-Century Empire Builder, built by ACF in 1951. Both cars, like the others in the picture, were on blocks, sans trucks. The GN car is owned by the same party who owns the 2 slumbercoaches. It was painted Big Sky Blue a few years ago and is currently stored in an industrial park in the Denver area. It is fairly complete inside, everything considered, but as can be seen the car is missing a few items underneath. Thanks, Topfuel, for the info on the USAX car and GN #1203! Ordered in December 1945, delivered between December 1948 and March 1949. 6DB sleeper 22 seat buffet lounge. #10600 Big Moose Lake renumbered in May 1965 to #653 for parlor service, retired in 1967. Listed by Randall as sold to Tyler Robbins, listed by Link as transferred to MofW as #X-23470. Current status unknown. #10601 Cayuga Lake retired in April 1961 and scrapped. #10602 Cranberry Lake retired in June 1966 and sold to Jones Properties. Current status unknown. #10603 Mirror Lake renumbered in July 1964 to #652 for parlor service, retired in 1967 and sold to Ted Church. Current status unknown. #10604 Oneida Lake retired in June 1961 and sold to Jones Properties, renamed Richard Dale. Current status unknown. #10605 Otisco Lake retired in July 1964 and scrapped. #10606 Otsego Lake renumbered in July 1964 to #651 for parlor service, retired in 1967. Listed by Randall as transferred to MofW, number unknown, and assigned to the Toledo wreck train. Listed by Link as sold to the Midwest Railway Foundation. Current status unknown. #10607 Otter Lake. Listed by Randall as retired in 1961 and scrapped. Listed by Link as retired in August 1964. #10608 Raquette Lake renumbered in May 1965 to #654 for parlor service, retired in April 1968 and scrapped. #10609 Saranac Lake reconfigured in January 1966 to commuter bar #1598, similar to the #659 (ex-Mountain Stream), with a standee (counter) bar and 3 card rooms (or "day rooms"), each with a 4 seat card table and 1 of the bedroom sofas. To PC #4422. Current status unknown. #10610 Seneca Lake. Listed by Randall as retired in 1961 and scrapped. Listed by Link as retired in August 1964. #10611 Silver Lake. Listed by Randall as retired in 1961 and scrapped. Listed by Link as retired in July 1964. #10612 Skaneateles Lake retired in July 1961 and scrapped. #10613 Trout Lake. Listed by Randall as retired in 1961 and scrapped. Listed by Link as retired in August 1964. #10614 Tupper Lake renumbered in April 1966 to #655 for parlor service, retired in November 1967 and sold to GE, converted to test car (dynamometer) GECX #100. #10615 Walton Lake reconfigured to commuter bar #1597, similar to the #659 (ex-Mountain Stream), with a standee (counter) bar and 3 card rooms (or "day rooms"), each with a 4 seat card table and 1 of the bedroom sofas. Randall lists the car as reconfigured in 1966, Link lists the car as reconfigured in December 1965. To PC #4421. Current status unknown. Oneida Lake was sold by Jones Properties to SBC as the Cuauhtemoc as of 8/10/1967. Current status unknown. Ordered in December 1945. Randall lists cars as delivered between April and May 1949, Madden lists cars as delivered between April and June 1949. #10500 Port of Buffalo retired and sold to Ringling Brothers. Randall lists retirement date as 1968, Link lists retirement date as April 1967. Current status unknown. #10501. Randall lists name as Port Byron, Link lists name as Port of Byron. Retired and sold to Ringling Brothers. Randall lists retirement date as 1968, Link lists retirement date as April 1967. Current status unknown. #10502 Port of Albany. Randall lists car as retired in 1968 and sold to Judge Roy Hofheinz. Link lists car as retired in April 1967 and sold to Ringling Brothers. Current status unknown. #10503 Port of Boston. Randall lists car as retired in 1968 and sold to Judge Roy Hofheinz. Link lists car as retired in April 1967 and sold to Ringling Brothers. Current status unknown. #10504 Port of Lewiston wrecked in 1968. #10505. Randall lists name as Port Orange, Link lists name as Port of Orange. Randall lists car as retired in 1966 and sold to Jones Properties, renamed Dorothy Ann. Link lists car as retired in June 1966 and sold to SCD. Current status unknown. #10506 Port of Oswego. Randall lists car as retired in 1966 and sold to Jones Properties, renamed James Francis, and resold to NdeM as Valle De Mexico as of 9/2/1967. Link lists car as retired in June 1966 and sold to Ringling Brothers. Current status unknown. #10507 Port of Windsor retired and sold to Lake Shore RHS. Randall lists retirement date as 1968, Link lists retirement date as October 1967. #10508 Port of New York retired and sold to Ringling Brothers. Randall lists retirement date as 1968, Link lists retirement date as November 1967. Current status unknown. #10509. Randall lists name as Port Lawrence, Link lists name as Port of Lawrence. Wrecked in 1968. #10510. Randall lists name as Port Clinton, Link lists name as Port of Clinton. Retired and sold to Ted Church, later resold to Francis McGrath (when??). McGrath donated the car to the Western New York RHS in 1983. Randall lists retirement date as 1968, however, according to the WNYRHS website, the car was renumbered to PC #4213 (possibly as dormitory space??) before being sold to Church. #10511 Port of Detroit. Randall lists the car as retired in 1968 and sold to Judge Roy Hofheinz. Link lists the car as retired in April 1968 and sold to Ringling Brothers. Current status unknown. #10512 Port of Chicago retired in 1968 and sold to D.J. Joseph. #10513. Randall lists name as Port Chester, Link lists name as Port of Chester retired in June 1966 and sold to Jones Properties, renamed Janice Winifred, and resold to NdeM as of 8/20/1967. Madden lists 2 possible names for this car: Mali and Valle De Bravo. Randall lists 12 of the 14 cars as having the electronic brake variant HSCE (as opposed to the non-electric HSC) for assignment to the 20th Century Limited. The 2 cars which are listed as not having electronic brakes are the #10504 Port of Lewiston and #10505 Port Orange. Last edited by Rainier Rails on Sun Nov 09, 2014 5:12 am, edited 1 time in total. Ordered in December 1945. Randall lists cars as delivered in October 1948, Madden lists cars as delivered between July and October 1948. #10400 Caminada Bay sold in 1958 to CN #2052 Val Alain, rebuilt in 1977 to 52 seat chair ("daynighter") #5733. Current status unknown. #10401 Cape Cod Bay sold in 1959 to CRI&P and rebuilt to baggage #866, retired in 1968 and sold to Ringling Brothers. Current status unknown. #10402 Tampa Bay wrecked in 1958 and retired in March 1959. #10403 Tawas Bay sold in 1959 to IC and rebuilt in 1962 to baggage #1820, retired in 1971 and scrapped. #10404 Traverse Bay sold in 1958 to CN #2055 Val Cote, rebuilt in 1977 to 52 seat chair ("daynighter") #5734. Current status unknown. #10405 Three Mile Bay sold in 1958 to CN #2061 Valhalla, rebuilt in 1974 to baggage-14RM dormitory #9485. Current status unknown. #10406 James Bay sold in 1958 to CN #2064 Val Marie, rebuilt in 1977 to 52 seat chair ("daynighter") #5737. Current status unknown. #10407 Little Neck Bay sold in 1959 to IC as dormitory #1999, rebuilt in 1961 to 60' RPO-baggage #150, reconfigured in 1968 to baggage #1830 by removal of mail fixtures, retired in 1971 and scrapped. #10408 Manhasset Bay sold in 1959 to IC and rebuilt in 1961 to 60' RPO-baggage #151, reconfigured in 1968 to baggage #1831 by removal of mail fixtures, retired in 1971 and scrapped. #10409 Nahant Bay sold in 1959 to CRI&P and rebuilt to 60' RPO-baggage #755, retired in 1968 and sold to Ringling Brothers as RBX #131. Scrapped in 1990. #10410 New York Bay sold in 1959 to CRI&P and rebuilt to 60' RPO-baggage #756, retired in 1968 and sold to Ringling Brothers as RBX #133. Scrapped in 1990. #10411 Pigeon Bay sold in 1959 to CN #2073 Val Rose, rebuilt in 1974 to baggage-14RM dormitory #9488. Current status unknown. #10412 Quincy Bay sold in 1959 to CN #2072 Val Royal, wrecked in 1965. #10413 Raritan Bay sold in 1959 to CRI&P and rebuilt to 60' RPO-baggage #757, retired in 1968 and sold to Ringling Brothers as RBX #126. Scrapped in 1990. #10414 Saginaw Bay sold in 1959 to CRI&P and rebuilt to 60' RPO-baggage #758, retired in 1968 and sold to Ringling Brothers as RBX #128. Scrapped in 1990. #10415 Turtle Bay sold in 1959 to IC Fernwood, rebuilt in 1964 to 60' RPO-baggage #157, reconfigured in 1968 to baggage #1837 by removal of mail fixtures, retired in 1971 and scrapped. #10416 Peekskill Bay sold in 1959 to CRI&P and rebuilt to baggage #867, reconfigured in 1965 to 60' RPO-baggage #760, retired in 1968 and sold to Ringling Brothers. Current status unknown. #10418 Humber Bay, sold in 1958 to CN #2066 Valois, rebuilt in 1973 to baggage-14RM dormitory #9478. Current status unknown. #10419 Smithtown Bay, sold in 1959 to CN #2074 Val St. Michel, rebuilt in 1973 to baggage-14RM dormitory #9481. Current status unknown. #10420 Sodus Bay, sold in 1958 to CN #2058 Val d'Espoir, rebuilt in 1977 to 52 seat chair ("daynighter") #5738. Current status unknown. #10421 Birch Bay, sold in 1959 to CRI&P and rebuilt to baggage #864, retired in 1968 and sold to Ringling Brothers. Current status unknown. #10422 Delaware Bay, sold in 1958 to CN #2068 Valpoy, rebuilt in 1973 to baggage-14RM dormitory #9480. Current status unknown. #10423 Dorcas Bay, sold in 1958 to CN #2053 Val Brillant, rebuilt in 1973 to baggage-14RM dormitory #9482. Current status unknown. #10424 Dorchester Bay, sold in 1958 to CN #2060 Val Doucet, rebuilt in 1974 to baggage-14RM dormitory #9484. Current status unknown. #10425 Chesapeake Bay, sold in 1958 to CN #2062 Val Jalbert, rebuilt in 1977 to 52 seat chair ("daynighter") #5736. Current status unknown. #10426 Chippewa Bay, sold in 1959 to IC Flossmoor, rebuilt in 1964 to 10 seat lunch counter 16 seat diner 16 seat lounge #4202, retired in 1971 and sold to C.W. Taylor (Calvert City, KY), later moved next to depot in Lincoln, IL (when??). #10427 Sandusky Bay, sold in 1959 to IC Fort Dodge, rebuilt in 1966 to 10 seat lunch counter 16 seat diner 16 seat lounge #4203, wrecked in 1971 at Tonti, IL. #10428 Sandy Hook Bay, sold in 1958 to CN #2054 Val Cartier, rebuilt in 1973 to baggage-14RM dormitory #9476. Current status unknown. #10429 Mexico Bay, sold in 1959 to CRI&P and rebuilt to 60' RPO-baggage #759, retired in 1968 and sold to Ringling Brothers as RBX #130. Scrapped, 1993. #10430 Gardiners Bay, sold in 1958 to CN #2056 Valcourt, rebuilt in 1977 to 52 seat chair ("daynighter") #5735. Current status unknown. #10431 Mobile Bay, sold in 1959 to IC Fulton, rebuilt in 1963 to 60' RPO-baggage #156, reconfigured in 1970 to baggage #1840 by removal of mail fixtures, retired in 1971 and sold to private ownership, located in Marrero, LA, at Barataria Blvd. and 4th St.
#10432 Monterrey Bay, sold in 1959 to IC and rebuilt in 1963 to 60' RPO-baggage #155, reconfigured in 1968 to baggage #1835 by removal of mail fixtures, wrecked in 1968 at Lodi, IL. #10433 San Francisco Bay, sold in 1958 to CN #2070 Val St. Patrice, rebuilt in 1973 to baggage-14RM dormitory #9475. Current status unknown. #10434 Sheepshead Bay, sold in 1959 to CN #2071 Val Gagne, rebuilt in 1974 to baggage-14RM dormitory #9487. Current status unknown. #10435 Huntington Bay, sold in 1958 to CN #2057 Val d'Amour, rebuilt in 1974 to baggage-14RM dormitory #9483. Current status unknown. #10436 Jamaica Bay, sold in 1959 to CRI&P and rebuilt to baggage #865, retired in 1968 and sold to Ringling Brothers as RBX #138. Current status unknown. #10437 Casco Bay, sold in 1958 to CN #2059 Val d'Or, rebuilt in 1977 to 52 seat chair ("daynighter") #5732. Current status unknown. #10438 Chaumont Bay, sold in 1958 to CN #2065 Valmont, wrecked *(burned) in 1962. #10439 Wild Fowl Bay, sold in 1959 to IC and rebuilt in 1962 to baggage #1821, retired in 1971 and scrapped. #10440 Willoughby Bay, sold in 1959 to CRI&P and rebuilt to 60' RPO-baggage #754, retired in 1968 and sold to Ringling Brothers as RBX #132. Current status unknown. #10441 Great South Bay, sold in 1959 to IC and rebuilt in 1961 to 60' RPO-baggage #152, reconfigured in 1968 to baggage #1832 by removal of mail fixtures, retired in 1971 and scrapped. #10443 Thunder Bay, sold in 1958 to CN #2067 Valparaiso, rebuilt in 1973 to baggage-14RM dormitory #9479. Current status unknown. #10444 Sturgeon Bay, sold in 1959 to IC and rebuilt in 1962 to baggage #1822, wrecked in 1971 at Tonti, IL. Last edited by Rainier Rails on Sun Nov 09, 2014 4:05 am, edited 1 time in total. This car is at the Museum of Railway Workers, Colorado Springs, Co. I am about a week out in having a new Update for the Passenger Car Photo Index finished and one of the things I have made an effort to do is make it easier to track cars down as their ownership changed. Many cars now have links for subsequent owner listings (except for Amtrak) which will make tracking them down a bit easier. Thanks, Jerry, for all the info! Ordered in December 1945, delivered between April and June 1949. Between August and October 1961, 10 of these cars were rebuilt to 16DXR-10DRM Sleepercoaches #10810-#10819, in Budd Lot #9691-260, NYC Lot #2254. NYC referred to both the 24-8 and 16-10 cars as Sleepercoaches rather than Slumbercoaches. #10350 Albany Harbor retired in May 1966 and sold to Edwards International, resold to NdeM #546 Presa Danzho as of 3/19/1967, later SCD #546. Current status unknown. #10351 Ashtabula Harbor retired and sold to Edwards International, resold to NdeM Presa Chique as of 5/19/1967. Randall lists retirement date as 1966, Link lists retirement date as January 1967. Current status unknown. #10352 Bar Harbor retired in February 1968 and sold to Edwards International, resold to NdeM Presa Guadalupe as of 10/6/1968. Link lists sale to SCD. Current status unknown. #10353 Benton Harbor retired in February 1968 and sold to Edwards International, resold to NdeM #598 Presa Benito Juarez as of 10/3/1968. Link lists sale to SCD. In the Huehuetoca scrap line as of 11/24/2000. #10354. Randall spells name as Boothbay Harbor, Madden and Link spell name as Booth Bay Harbor. Retired in November 1967 and sold to Edwards International, resold to NdeM Presa Las Lajas as of 10/7/1968. Link lists sale to SCD. Current status unknown. #10355 Boston Harbor retired in November 1967 and sold to Edwards International, resold to NdeM. Randall lists NdeM name as Presa Tenango, Madden lists NdeM name as Presa Lazaro Cardenas as of 10/4/1968. Link lists sale to SCD. Current status unknown. #10356 Buffalo Harbor retired and sold to Edwards International, resold to NdeM Presa Santa Teresa as of 5/19/1967. Randall lists retirement date as 1966, Link lists retirement date as February 1968 and sale to SCD. Current status unknown. #10357 Cape Vincent Harbor retired and sold to Edwards International, resold to NdeM Presa Infiernillo as of 5/19/1967. Randall lists retirement date as 1966, Link lists retirement date as February 1968 and sale to SCD. Current status unknown. #10358 Charlotte Harbor retired in November 1967 and sold to Edwards International, resold to NdeM #603 Presa Pabellon as of 10/6/1968. Link lists sale to SCD. In the Huehuetoca scrap line as of 11/24/2000. #10359 Cheboygan Harbor retired in November 1966 and sold to Edwards International, resold to NdeM Presa Falcon as of 5/19/1967. Link lists sale to SCD. Current status unknown. #10360 Fairport Harbor rebuilt in August 1961 to Sleepercoach #10812 to PC #4202, sold in 1971 to Amtrak #2001, converted in July 1979 to HEP #2051, name reapplied, retired and listed for sale as of September 1996. Current status unknown. #10361 Gary Harbor retired and sold to Edwards International, resold to NdeM #545 Presa La Angostura as of 3/18/1967. Renamed Presa El Azucar as of 6/13/1967. In the Huehuetoca scrap line as of 10/12/1999. Randall lists retirement date as 1966, Link lists retirement date as January 1967. #10362 Cleveland Harbor retired in May 1966 and sold to Edwards International, resold to NdeM Presa Tesoyo as of 6/5/1967. Current status unknown. #10363 Conneaut Harbor retired in May 1966 and sold to Edwards International, resold to NdeM Presa Valsequillo as of 6/6/1967. Current status unknown. #10364 Dunkirk Harbor rebuilt in September 1961 to Sleepercoach #10810 to PC #4200, sold in 1971 to Amtrak #2000, converted in August 1979 to HEP #2052, name reapplied, retired and listed for sale as of October 1995. Current status unknown. #10365 Erie Harbor rebuilt in August 1961 to Sleepercoach #10811, retired in April 1968 and scrapped. #10366. Randall and Link list name as Michigan Harbor, Madden lists name as Michigan City Harbor. Retired and sold to Edwards International, resold to NdeM Presa Malpaso as of 5/19/1967. Randall lists retirement date as 1966, Link lists retirement date as January 1967. Current status unknown. #10367 Monroe Harbor rebuilt in October 1961 to Sleepercoach #10814 to PC #4204, sold in 1971 to Amtrak #2002, converted in July 1979 to HEP #2050, name reapplied, retired and listed for sale as of September 1996. Current status unknown. #10368 Henderson Harbor retired in November 1967 and sold to Edwards International, resold to NdeM Presa A. Lopez Mateos as of 9/30/1968. Current status unknown. #10369 Home Harbor retired in November 1967 and sold to Edwards International, resold to NdeM Presa Presidente Aleman as of 10/5/1968. Current status unknown. #10370 Indiana Harbor rebuilt in September 1961 to Sleepercoach #10813, retired in April 1968 and scrapped. #10371 Mackinac Harbor retired in November 1966 and sold to Edwards International, resold to NdeM Presa La Amistad as of 5/7/1967. Current status unknown. #10372 Vermillion Harbor rebuilt in September 1961 to Sleepercoach #10818 to PC #4208, sold in 1971 to Amtrak #2006, converted in March 1982 to HEP #2056, name reapplied. Wrecked in August 1994 in the consist of the westbound #49 Lake Shore Limited at Batavia, NY. #10373 York Harbor rebuilt in August 1961 to Sleepercoach #10819, retired in April 1968 and scrapped. #10374 Oak Harbor retired in November 1966 and sold to Edwards International, resold to NdeM Presa Cointzio as of 5/19/1967. Current status unknown. #10375 Ogdensburg Harbor retired in November 1967 and sold to Edwards International, resold to NdeM Presa Francisco Villa as of 10/1/1968. Link lists sale to SCD. Current status unknown. #10376. Randall spells name as Sackets Harbor, Madden and Link spell name as Sacketts Harbor. Retired and sold to Edwards International, resold to NdeM Presa Tecamachalco as of 5/19/1967. Randall lists retirement date as 1966, Link lists retirement date as January 1967 and sale to SCD. Current status unknown. #10377 South Haven Harbor rebuilt in September 1961 to Sleepercoach #10815 to PC #4205, sold in 1971 to Amtrak #2003, converted in January 1982 to HEP #2054, name reapplied, retired and listed for sale as of September 1996. Current status unknown. #10378 Tarrytown Harbor retired in November 1966 and sold to Edwards International, resold to NdeM Presa Solis as of 5/20/1967. Current status unknown. #10379 Toledo Harbor rebuilt in October 1961 to Sleepercoach #10816 to PC #4206, sold in 1971 to Amtrak #2004, converted in February 1982 to HEP #2055, name reapplied, retired and listed for sale as of September 1996. Acquired by ITAX as parts source and scrapped in 2007. #10380 Tonawanda Harbor rebuilt in October 1961 to Sleepercoach #10817 to PC #4207, sold in 1971 to Amtrak #2005, converted in August 1979 to HEP #2053, name reapplied, retired and listed for sale as of September 1996. Acquired by Colorado Railcar along with NYC 24-8 Sleepercoach #10800 (NP #333 Loch Tay), both cars were planned as crew dormitories for the cancelled Marlboro Unlimited. Both cars were sold to private ownership and stored sans trucks in Strasburg, CO.
here is what I have on the CNR "VAL" series. I did get to travel in these cars both as a sleeping car and Daynighter, so there is a bit of personal history. Added info is in bold. #10404 Traverse Bay sold in 1958 to CN #2055 Val Cote, rebuilt in 1977 to 52 seat chair ("daynighter") # 5734. 1978 to VIA, 1992 (April) to Paul Weber, Orillia ON and used as part of a restaurant near Orillia ON. The last time I ate there, the car still had it's "Daynighter" seating, where you could eat your burgers using the seat back fold down tables. #10405 Three Mile Bay sold in 1958 to CN #2061 Valhalla, rebuilt in 1974 to baggage-14RM dormitory # 9485. 1978 to VIA, My records indicate car was off roster prior to 1985 but no information. #10406 James Bay sold in 1958 to CN #2064 Val Marie, rebuilt in 1977 to 52 seat chair ("daynighter") # 5737. 1978 to VIA, 1993 (Aug) to Les Trains Touriste St-Laurent, La Malbaie QC (TTSL) # 5737 "CAP BLANC". 1997 to Waterloo St. Jacobs Railway # 5737. 2000 to 2007 stored, VIA's Mimico Yard, Toronto ON, 2007 (Oct) to Medina Railroad Museum, Medina NY # 5737. #10411 Pigeon Bay sold in 1959 to CN # 2073 Val Rose, rebuilt in 1974 to baggage-14RM dormitory #9488, 1978 to VIA, 1990 (May) to Great Canadian Railtour # 9488 (used as crew dorm/ gift shop). 2006 converted to Generator car. #10417 Haverstraw Bay, sold in 1958 to CN #2069 Valrita, rebuilt in 1974 to baggage-14RM dormitory #9486. 1978 to VIA, 1983 to Global Communications # 9486 "HAVERSTRAW BAY". 1986 (Feb) to NRHS-Blue Water Chapter. 2013 to Southern Prairie Railway / Ogema Heritage Railway Assoc, owned by Gary Southgate, Battleford SK (stored). #10418 Humber Bay, sold in 1958 to CN #2066 Valois, rebuilt in 1973 to baggage-14RM dormitory #9478. 1978 to VIA, 1990 (Sept) to Rail Voyages Ltd.
#10420 Sodus Bay, sold in 1958 to CN #2058 Val d'Espoir, rebuilt in 1977 to 52 seat chair ("daynighter") #5738. 1978 to VIA, 1996 (July) to Iron Road Railways, assigned Bangor & Aroostook division. #10422 Delaware Bay, sold in 1958 to CN #2068 Valpoy, rebuilt in 1973 to baggage-14RM dormitory #9480. 1978 to VIA, 1990 (Sept) to Rail Voyages Ltd.
#10423 Dorcas Bay, sold in 1958 to CN #2053 Val Brillant, rebuilt in 1973 to baggage-14RM dormitory #9482. 1978 to VIA, 1995 to Halton County Radial Railway Museum. #10424 Dorchester Bay, sold in 1958 to CN #2060 Val Doucet, rebuilt in 1974 to baggage-14RM dormitory #9484. 1978 to VIA, My records indicate car was off roster prior to 1985 but no information. #10425 Chesapeake Bay, sold in 1958 to CN #2062 Val Jalbert, rebuilt in 1977 to 52 seat chair ("daynighter") #5736. 1978 to VIA, 1996 to Kootenay Central Rail Services, stored at Canadian Museum of Rail Travel, Cranbrook BC. #10430 Gardiners Bay, sold in 1958 to CN #2056 Valcourt, rebuilt in 1977 to 52 seat chair ("daynighter") #5735. 1995 (Feb) to R. Clancey, Coniva CA. 2000c may have gone to Blue Ridge as # 105 or 106. #10434 Sheepshead Bay, sold in 1959 to CN #2071 Val Gagne, rebuilt in 1974 to baggage-14RM dormitory #9487. 1990 (May) to Great Canadian Railtour # 9487 (used as crew dorm/ gift shop). 2006 converted to Generator car. #10437 Casco Bay, sold in 1958 to CN #2059 Val d'Or, rebuilt in 1977 to 52 seat chair ("daynighter") #5732. 1978 to VIA, 1996 to Kootenay Central Rail Services, stored at Canadian Museum of Rail Travel, Cranbrook BC. Thanks, Richard, for all the info! Thanks Ted for the information, I had a gap in my database, and had the cars listed twice. But the pictures, reminded me of the horrible Daynighters that were converted from "RIVER" series by VIA in 1978. They plated over several windows, but neglected to install or to move windows so each seat would have access to a window, leaving about 8 seats with a wall. Wonderful, when assigned to Western Canada and tourists wanted to view the scenery. Daynighter class was allowed access to the dome cars in off season, but heavy summer months the domes were only for sleeping car passengers. I am appreciating this site, as because of the Federal Government mandated VIA Rail cuts, between 1990 and 1995 VIA disposed of almost 500 passenger cars, so lists are not very accurate, so fourtunatley many acquiring VIA equipment has continued to use VIA's numbers, helping sort and ID. Delivered in October 1959 and leased until sold to NP in 1964. #10800 sold in 1964 to NP #333 Loch Tay, planned to be renumbered to BN #1488, which was not applied, sold in 1971 to Amtrak #2031, converted in September 1981 to HEP #2089, retired and listed for sale as of October 1995. Acquired by Colorado Railcar along with 16-10 Sleepercoach #10817 (ex-#10380 Tonawanda Harbor), both cars were planned as crew dormitories for the cancelled Marlboro Unlimited. Both cars were sold to private ownership and stored sans trucks in Strasburg, CO.
#10801 sold in 1964 to NP #334 Loch Rannoch, renumbered to BN #1489, sold in 1971 to Amtrak #2032, converted in March 1980 to HEP #2082, retired and listed for sale as of September 1996. Acquired by ITAX, scrapped in 2012. #10802 sold in 1964 to NP #335 Loch Arkaig, transferred in 1965 to CB&Q #335, planned to be renumbered to BN #1490, which was not applied, sold in 1971 to Amtrak #2033, converted in April 1981 to HEP #2092, retired and listed for sale as of September 1996. Acquired by the Atlanta Chapter-Southeastern RY Museum (Duluth, GA). #10803 sold in 1964 to NP #336 Loch Awe, transferred in 1965 to CB&Q #336, planned to be renumbered to BN #1491, which was not applied, sold in 1971 to Amtrak #2034, converted in March 1980 to HEP #2083, wrecked in July 1984. Looking at my notes, I think this car was in the wreck of the northbound #60 Montrealer at Williston, VT, on July 6th, 1984.